As with any big boxing event, there was a lot going on behind the scenes during Deontay Wilder’s thrilling 10th round TKO victory over Luis Ortiz on Saturday night. The match took place as part of a Premier Boxing Champions telecast aired on SHOWTIME CHAMPIONSHIP BOXING from the Barclays Center in Brooklyn, New York. Wilder successfully defended his WBC title in a gritty, back-and-forth brawl in which he knocked down his Cuban foe in the fifth round, survived some rocky moments, and scored a knockout in the 10th round. The Alabama native is the man of hour once again, but let’s not forget all of the boxing personalities that were in the building during this performance. One of those men was former IBF junior welterweight champion Jermall Charlo, who was in town checking out the action, as well as fielding possible questions about his owner career. 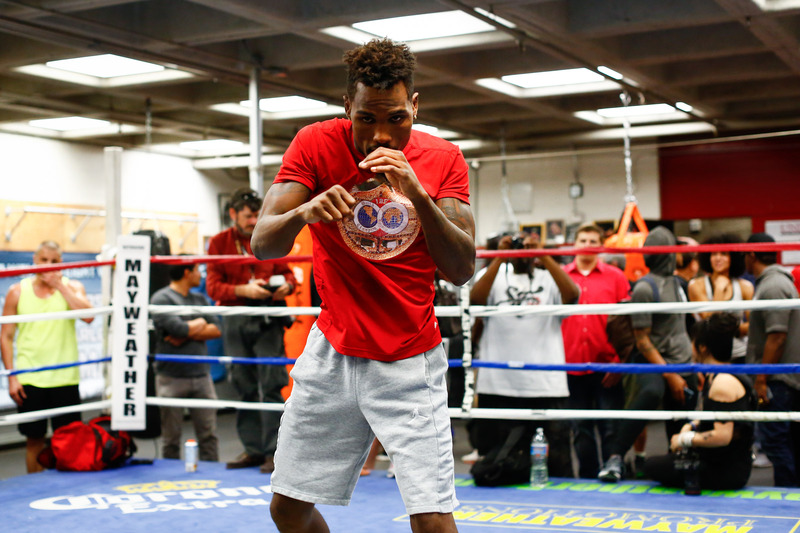 Charlo (26-0, 20 KO’s) is a big name at 160 pounds these days and is presently eyeing an April 21 return to the ring, where he will be facing off with once-beaten Hugo Centeno Jr. Inside of the Barclays Center for the interim WBC middleweight title. In addition to his bout with Centeno, Charlo of course has been eyeing such names as lineal middleweight champion Gennady Golovkin, two-division world champion and Mexican superstar Saul ‘Canelo’ Alvarez, WBO middleweight champion Billy Joe Saunders, and Jacobs. While speaking in the lobby post-fight, Charlo could be seen in a video with FightHype.com where he is discussing many topics, including a potential matchup with Jacobs. Moments later, Jacobs just so happens to arrive and the two men began to exchange words with one another. Jacobs’ mentioning of “M’s” is in reference to millions, as he has faced Gennady Golovkin for reportedly in upwards of $3 million while Charlo is still awaiting his first million-dollar payday. Charlo then refuted back on Jacobs. Jacobs then took a moment to try to brew things down. So too did Charlo answer. “You know what I’m about. You know. You know it,” said Charlo. Very interesting dialogue between these two fighters. Let’s hope we can see them in the ring later in 2018. Sergey Kovalev rolls forward with TKO of Mikhalkin; is Dmitry Bivol, Badou Jack showdowns next?